Chutney does not have any specific meaning, but is a spicy condiment used to garnish various Indian dishes. It is a side dish, specially used in North Indian food. Chutney is a mix of sweet, spicy and sour flavour. It is made by adding sugar and different spices. To give flavours we can make it with mango, mint, green coriander, coconut, peanuts or ginger and garlic and of course last but not the least Tamarind (imli). Some chutneys are in gelatinous consistency and some are in liquid form. South Indian chutneys are mostly prepared in gelatinous consistency. Their special and famous chutneys are made of peanuts and coconut. South Indians prefer to eat peanut or coconut chutneys with Dosa and Idlis. Americans and Europeans use vinegar and also other flavours in chutneys. Homemade chutneys are much more healthier than the preserved chutneys that are available in super markets. North Indians like to eat chutney with various foods like dal-chawal, Missi roti and many more dishes. Above all they make chutneys specially for chaats. We can give variations to chutneys by adding different fruits and spices to it. 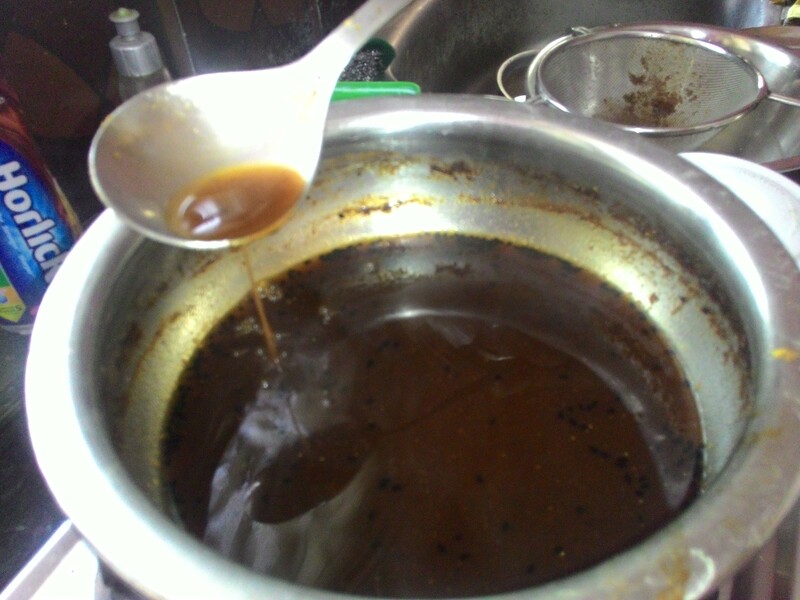 Imli ki Chutney (or the Tamarind Chutney) is also called Saunth ki Chutney. You can have Samosa, Kachauri, Dahi Bada, Bhel Puri, Sev Puri, Aloo Tikki, Pani Puri, Bhajiya, etc with Imli ki Chutney. Once cooked, keep it in a container (probably air-tight) and store it in refrigerator. Imli ki Chutney can be stored for 25-30 days. Soak tamarind in water for 1 hour. 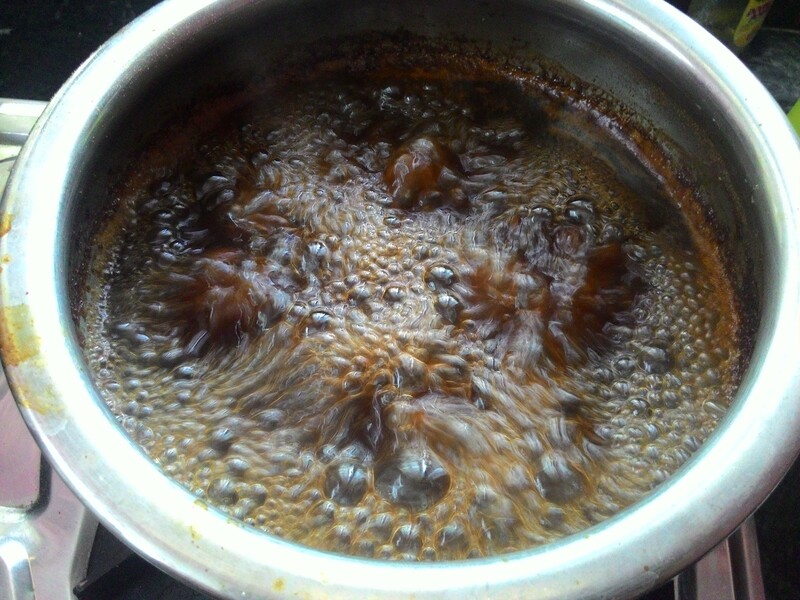 After an hour, squeeze the pulp of Imli in the same pot and strain it into the cooking pot. Now keep it on medium flame. When it becomes little warm add sugar to it and mix well. After two minutes of cooking, add saunth or the ginger powder. If you don’t have saunth (ginger powder), chop fresh ginger into small pieces and put it in the cooking pot. Now add Kalaunji (onion seeds or Nigella), coconut, chilli powder, black salt and cinnamon powder and constantly stir it for 5 minutes. Let the spices mix well into the pulp. Keep it on the medium flame and stir it to avoid overflow the fluid from the pot. Bring it to boil for 4-5 times and low the flame. Keep the pot for 15 minutes on low flame and and let it set down. Cook until the mixtures gets gelatinous consistency. Put off the gas. Let the chutney cool down. The sweet, sour and tangy Imli ki Chutney is ready to be served or stored. Serve it into a serving bowl or transfer into a jar and put it in refrigerator. Serve it with the tasty chaat items. I have added cinnamon powder to make Imli ki Chutney more healthy. Imli aur Gur ki Chutney is made by following the same procedure of the above recipe. You just need to replace sugar with 3-4 medium pieces of jaggery or gur. Melt it first and then add the spices like cinnamon, saunth, etc.